Playa Norte RV Park is located near Los Barriles, on the East Cape of Baja Sur. We are 70 miles (113 km) from Cabo San Lucas, 73 miles (117 km) from La Paz, the capital of Baja Sur, or a 1.5 hour drive from either. Los Cabos International Airport (SJD) is about 45 miles (72 km) away. Getting here is easy, whatever way you decide to come. 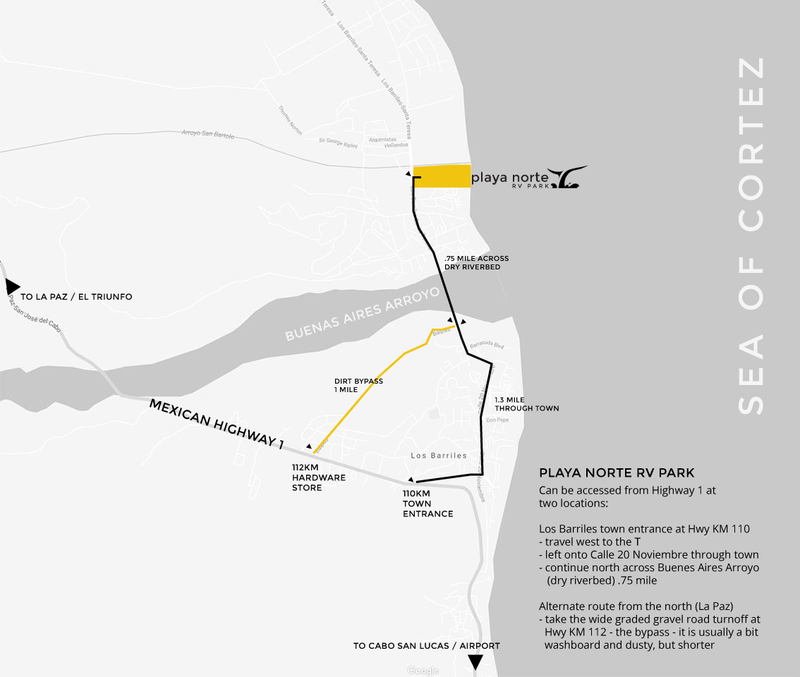 Leave the Baja Highway at Km 110 at the entrance into downtown Los Barriles, turn north along main street (Calle 20 Noviembre). Leaving town, cross a dry riverbed & pass a small store. The RV park is on the right in one block. Welcome! An alternative route from the north is a very wide graded gravel road by the construction materials store at Km 112. It is usually a bit washboard, but shorter. Happily helping to find the best properties in the East Cape area of Baja Sur for over twenty years. Please view our Real Estate properties, or contact us for help in finding your dream location.